Sixteen year old Cameron Smith is just another slacker at his Texas high school. Until he gets diagnosed with Creutzfeldt–Jakob disease (aka mad cow disease), starts seeing angels, and ends up on a road trip to DisneyWorld with a dwarf, a yard gnome, and an angel. That description cannot describe just how fantastic this book is. My full review will go into more detail. Bray has created one of those rare things in books. A character so fully realized, so alive that you know him. He's that real. And his adventures may be wacky and weird, but you believe in them, you believe in Cameron. At 480 pages, this is a book you never want to end. You want to savor the words, the humor, the language, the inventiveness of Bray ("the Church of Everlasting Satisfaction and Snack 'N' Bowl"), the ride; you don't want your time with Cameron to end. Dig your ARC out from BEA. Put it on your "must get" list for ALA. Add it to your orders for when it gets published in September. Yes, it is that good. I am trying to compare it to something, in part because every plot synopsis I read did not engage me; rather, it was readers I respected saying "OMFG you must read this." Multiple readers. But this came to me this morning. Going Bovine is the heir to Douglas Adams. All those readers (adults and teens) who have adored The Hitchhiker's Guide to the Galaxy for its mix of humor and seriousness and inventiveness will be reading and reading Going Bovine. Hell, Adams started with killing the population of the Earth and we laughed; so what's wrong with laughing as one teen struggles with mad cow disease? I want to keep on talking about this... but that will have to wait until closer to publication date! Teaser: A mini post about a book I've read that won't be published for several months. The full review will be posted closer to the publication date. A resounding recommendation! I'm putting it on my list. I'll have to recommend it to my husband, a big Adam's fan. From the title, I always thought this was about a girl. SHould be interesting reading! 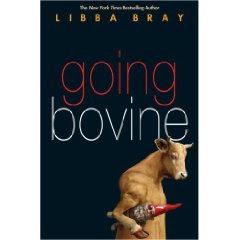 I love Libba Bray's other stuff (a great and terrible beauty trilogy) and can't wait for Going Bovine to be released. Particularly because of all the great reviews i have read of it, just like this one!